Exterior images by Pierre Galant Photography. The Architecture MasterPrize (AMP) aims to become one of the most respected architectural awards and set a new benchmark for the architectural and design professions globally. At its best, architecture and design is about embracing technology to set the imagination free. It’s about innovating, pushing boundaries, and utilizing technologies and materials to realize the near impossible. It is about creating built forms, structures and spaces that can send our spirits soaring, reaffirm our humanity, and ultimately touch our very souls. This building is fast becoming iconic and has been featured in numerous commercials, including a Toyota TV ad. This project cuts five new lots from one 516 square meter lot for five new townhomes. Units range from 140 to 170 square meters. To bring some light to this downtrodden LA neighborhood, the project provides optimistic loft-like creative housing with a wrinkle. The Wrinkle is an imperfect non-repeating faceted modulation of the typical Los Angeles stucco facade, fractured into sections and given a color code for home-owners to find identity and difference. With five and a half meter ceilings, tall narrow windows, and lofty spaces with raw materials, the Los Angeles styled townhome is born. The landscaping matches the colors of each window frame. The play of light on the facade highlights the crystal-like complexity of the structure. This home was originally built as a 1923 English Tudor, and was later reimagined by Koffka/Phakos Architects. The open kitchen and dining area are the focal points of the main floor. This red office makes a bold statement, for the powerful entrepreneur. Built-ins here, built-ins there, built-ins everywhere! And more built-ins in the kids bedroom. A Seattle couple wanted an escape from winter weather, and decided to remodel a home in sunny Ojai, California. The home has modern white shiplap walls throughout, but they wanted a little change of pace for the guest bed and bathroom. They hired Architectural Consultant Christina Harris to help them with their color choices. "In the end – in keeping with the clean lines of the rest of the house, the two neutral grays on the walls in the guest quarters, partnered with the client's white accents" says Christina. 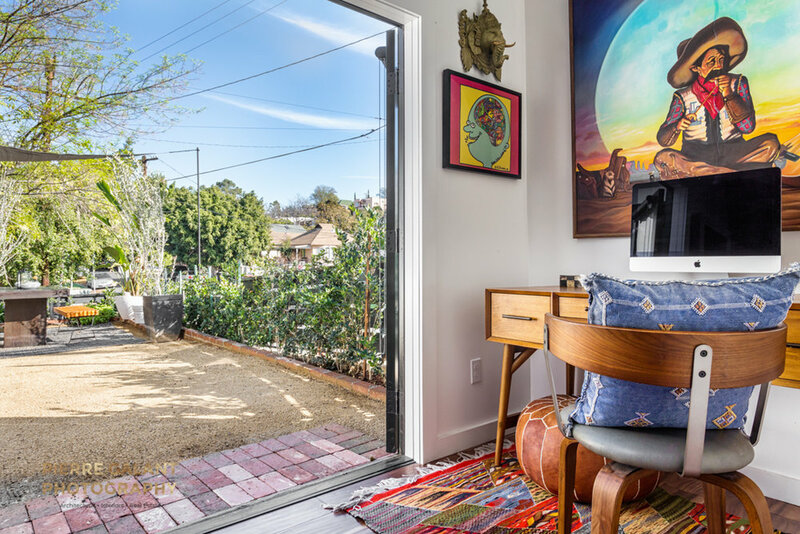 "The look is modern, yet cozy, which is perfect for out-of-town guests to relax and soak in the laid-back, artsy atmosphere of Ojai"
Designer Cleo Vauban took over and renovated what used to be a dismal and overcrowded duplex rental in Echo Park. The back property is still being worked on, but here is a before and after of the transformation of the front unit.